As the goddess Durga prepares her descent upon Earth, her paternal abode's extravagant red-carpet welcome is already underway. Bangladesh, home to the second largest population of Hindus, will once again go all out to conjure a welcome fitting enough not only for a Goddess, but for a symbol of Independence, Morality and the ultimate triumph of Good over ill. However, all the celebration isn't just reserved for the decoration of Pandals; there's the matter of the proper meal as well. 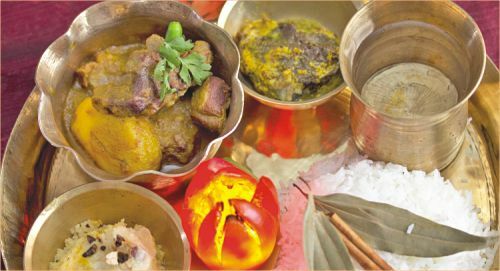 Celebrated over ten days, Durga Puja, arguably the biggest celebration to transcend religion, is fascinating for numerous reasons, one of them being the unique customary preparation of meals during the last five days. Awaiting the arrival of their holy mother, the women begin the festival by observing a fast and strictly avoiding all non-vegetarian meals. The Goddess descends from heaven and makes a statement by visiting those at the lowest rung of the maligned caste system first, before meeting her other children. 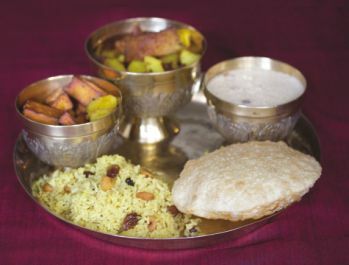 In preparation for her arrival, various items are cooked, including luchi, fulkobi aloo'r daal. In between the meal and the magic, special prayers are offered for Durga and her return, along with her children's, to her maternal house becomes an impatient wait. The vegetable items are the specialist items of the day of course and thus a unique one is deserving of more than just a fleeting welcome. Potatoes, cauliflower, lentil, bay leaf, cumin seeds, red chilli, asafoetida, ginger paste, tomato paste, grinded jeera and sugar to taste. Dice Potatoes and cut the cauliflower into required proportions and fry deeply. Keep them aside. Heat oil and add lentil, bay leaf, cumin seeds and one or two red chillis. Add a pinch of asafoetida and fry for a minute. Pour potato and cauliflower; add ginger paste, tomato paste, grinded jeera and a bit of sugar to taste. Stir around for three or four minutes and add holud and chilli paste. Traditionally, a generous helping of sugar is a key ingredient in all dishes prepared, as it is believed to help pronounce the taste of the salt. 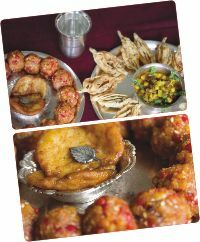 The festival kicks off in style on the sixth day, where the special flavours of traditional Bengal mix and play off each other, serving up a sizzling palate of delights. 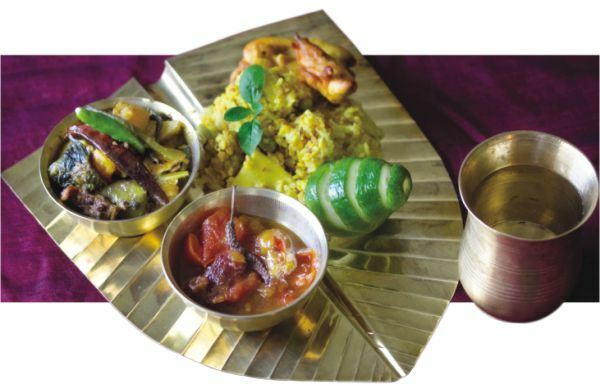 The customary preparation of khichuri, chutney and the fan favourite labra all grace the dining table to hand out the age old tastes so many of us crave. The labra is one that you must try out, if you haven't done so already. Dry Masala: Coriander, cumin seeds, red chilli tossed on a heated pan and dry grinded to powder. Wet Paste: Ginger and cumin seeds paste freshly made. Clean thoroughly and cut all the vegetables into two-inch long pieces, preferably of similar shape and size. Heat mustard oil in a heavy bottom pan and add phoron, red chillies and asafoetida (hing) powder and the wet paste. Subsequently add the potato, radish and cauliflower. After about five minutes, add pumpkin, brinjal and toss well to mix. Add Haldi salt and a bit of sugar for taste, along with the powder masala. Cook on low flame, keeping covered, so that the vegetables cook in their own juice. If required, sprinkle a little bit of hot water. After about ten minutes of cooking on low flame, increase the flame for a couple of seconds and your Labra is ready to be served traditionally with khichuri in the Bengali style. This is considered to be a very important day for the festival. On Ashtami, the Anjali is applied on the deity and a fast is observed until the blessings are received. Some young girls still enjoy being put on the pedestal and treated as little goddess mothers. Since the decline of the customary sacrifice of the buffalo, the non-vegetarian aspect of the day is highlighted even more. 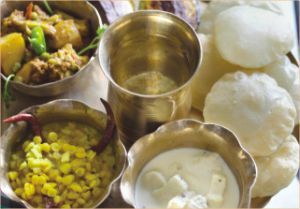 Usually, no non-veg is cooked on this day and the meals are based more on luchi, polao, lentil-based dishes, payesh, chola daal, paneer, beguni, etc. This added dimension of a healthy diet gives the stomach the respite it needs. This dish is a vegetarian dish and purely lentil based, made out of cholar daal or boot daal. It is a tedious process but at the end the delicate taste is worth a try. This dish probably has its origins in old West Bengal. 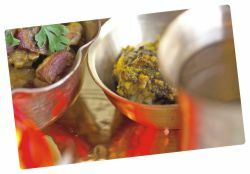 The gravy is cooked with very little spices so that each fragrance of the Dhoka is distinct. Soak the daal overnight and make a paste adding little water. It is better to use a stone grinder. Add salt, sugar, ½ teaspoon turmeric, red chilli, cumin, coriander, black pepper, sugar, cinnamon, cardamom and 1 teaspoon aniseed to the paste and mix very thoroughly. Heat 2 teaspoons oil in a wok, add the dough and stir fry till the mixture is a little dry. Take a flat-bottomed plate with an inch depth and smear it with a little oil. Now spread the above mixture on it and press tightly to smoothen it. Let it cool. Then cut it into small diamond shapes. Heat oil in a frying pan and deep-fry the Dhokas till they get hard but do not overcook them. In the same oil, fry the potatoes till golden brown and set aside. Now add cumin seeds and bay leaf. Let the seeds crackle. Mix turmeric, red chilli powder, cumin powder, coriander powder and ginger paste with little water and add this to the oil. Cook for a while. Add the potatoes and further cook for 1-2 mins. Then add water, salt and sugar. Cover and cook till potatoes are cooked. Now carefully drop the Dhokas and just boil for 2 minutes on a very low flame. Before taking off from fire, add a spoonful of ghee and roasted cumin and red chilli powder pounded together. Heat mustard oil in a thick-bottom pan, preferably flat. Add mustard whole seeds and 1 green chilli. Then add the mustard paste with powder and a little salt. Sprinkle a little hot water into this thick gravy and mix well. Lower the flame and place the fish pieces carefully into the gravy one by one, taking care that the pieces are not fully submerged inside the gravy. Next, layer the fish top side with the tamarind paste, without mixing the mustard gravy. Cover and cook on low flame for about 10 minutes and your Dui-Swader Maach is ready to be served with plain steamed rice. Enjoy the combination of tangy mustard flavour on the side and the sour tamarind flavour on the other side. And before you know it, time has already passed and it's time to bid farewell once again. The farewell is prolonged as much as possible, delaying the inevitable, however the day must come to an end. The tears flow endless, salty drops mingled with the intoxicating fumes and flavours of the sweet meat all around, a speciality of the day. 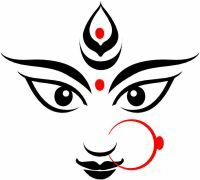 Goddess Durga says her final good-bye, till next year and leaves with the knowledge that she has once again reunited families. As customs dictate, the entire family helps with the preparation throughout the entirety of the festivals and hence bonds are strengthened and renewed and hopefully kept intact till the next time she visits again. Everyone jostles to give the grandest farewell and everyone makes the same dishes, competing with each other in terms of recipe and taste. The elders all give their blessings and up close, the differences in religion we make so much about seems to blur; we are witness to the spiritual connection and its presence is overwhelming. On that note, we too bid adieu, leaving behind one last recipe that shall hopefully make your Puja complete. Add the kalojeera, joan, salt and 3 tablespoons of oil into the maida. Add water (normal) to make the dough. Roll the dough into small thin round chapatis, around 3" diameter. Cut the middle of the chapati with the knife. Then roll the chapati into a cylinder. Twist both the edges of the cylinder proper, so that it looks some what like a hurricane lamp. Deep fry it in oil, till it becomes a little brownish in colour. Keep outside till it cools down. Later it can be kept in a contained for several weeks.